The Bundesliga started again last weekend. After Hoffenheim´s first adventure in Europe they now can fully concentrate on the Bundesliga. As captain Kevin Vogt recently mentioned the goal is to reach a spot in the Bundesliga which qualifies Hoffenheim for the International competitions. Against Bremen they wanted to start with a win. After a solid first half Hoffenheim were up-front with one goal, however, Bremen scored the equaliser and in the end both teams have to life with one point. After Sandro Wagner got sold to Bayern, Julian Nagelsmann has less options up-front. In their common 3-1-4-2 Uth and Gnabry started up-front. Furthermore, Nagelsmann had to replace Demirbay and Amiri. Both couldn´t participate in that game. Therefore, the young Dennis Geiger who signed a new contract last week started with Lukas Rupp and Grillitsch in midfield. Zuber and Kaderabek played on the wing and joined Vogt, Bicakcic and Hübner in the last line during the defensive phase. Behind the defending line Oliver Baumann played in goal. Bremen´s young head-coach Florian Kohfeldt selected a 4-3-3 formation. In goal Pavlenka played a great game and secured the point for Werder. In front of Pavlenka, Gebre Selassie who scored the goal for Bremen defended on the right side while Augustinsson played as a left back. In front of the central defenders Moisander and Veljkovic Phillipp Bagfrede played as a pivot and got supported by Eggestein and Junuzovic. Up-front Kohfeldt lined Kainz, Belfodil and former national player Max Kruse who had a very free role in Bremen´s possession game. In the first half Hoffenheim was in control of the game. They dominated possession and where able to apply more pressure in the late phase of the first half in which they scored their only goal after a corner. As always Hoffenheim used a 3-1-4-2 in possession. The back-three of Hoffenheim is capable of playing dangerous passes which cut through the lines. Especially, Kevin Vogt is most involved in the build-up. He starts Hoffenheim´s game and is responsible to find solutions against the pressing of the opponent. For that Vogt has an interesting role in Hoffenheim´s build-up. Sometimes, Hoffenheim creates an asymmetrical back-three. Vogt pushes wider so he acts like a central defender in a back-four. Especially, when the goalkeeper has the ball, Vogt´s wider position helps to start the attacking phase easily. Hoffenheim focused on the left side quite often. So, Hübner can play wider and Zuber can push higher. This asymmetrical structure is harder to press because when the opponent plays man oriented this structure opens passing options. The wider position of Hübner opens the passing line for Vogt who plays a pass which cut trough the lines to Zuber. Hoffenheim is able to break through the first two lines of Werder. Behind their midfield Hoffenheim regularly found open space. Despite his wider position Vogt also can push in midfield with and without the ball, especially when a team tries to press man oriented Vogt can move into the midfield. Those movements open space for the other two defenders, also Vogt destabilizes the opponents pressing by moving forward. Against Bremen, Florian Grillitsch was the crucial factor for Hoffenheim´s build-up. 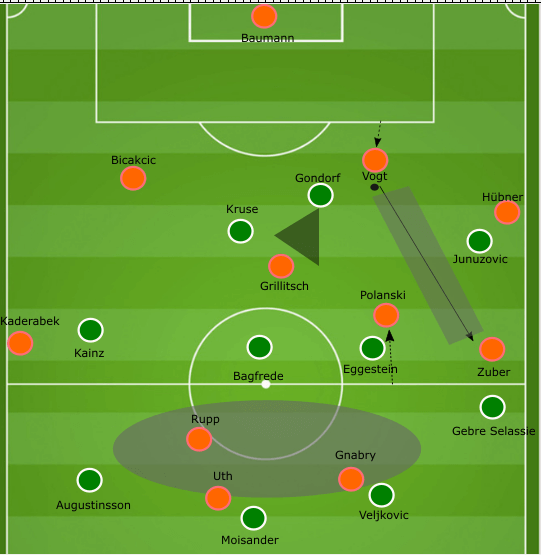 Bremen tried to cut the passing lines to the Austrian by using two strikers to press and close the lines or by following Grillitsch to apply pressure immediately when he received the ball. Almost every time when Grillitsch received the ball and had time to turn, Bremen faced dangerous situations. Because Grillitsch and sometimes Vogt or Hübner could break the midfield line of Bremen and therefore, get Rupp, Uth and Gnabry into good attacking situations. The first minutes Bremen pressed higher with a lot of man orientations. Therefore, Hoffenheim´s midfielders Rupp and Geiger positioned higher to create space and stretch Bremen´s defensive shape. So, without the immediate pressure from Bagfrede and Eggestein, it was easier for Hoffenheim to combine through Bremen´s shape because of their numerical superiority in build-up. Besides the passes to Grillitsch Hoffenheim was also able to create space for Zuber or Kaderabek who could push the ball forward. Both wingers got supported by the midfielders and Hoffenheim´s structure often looked connected against Bremen´s compact pressing. In the last third Hoffenheim focused on the centre. As I mentioned above they aimed to play passes in the ten-space. There Hoffenheim used lay-off passes and runs into depth without the ball. For example, Grillitsch played a line breaking pass. Uth moved two steps deeper to free himself up from the defenders while Gnabry made a run to create space for Uth who could either play a lay-off pass or turn with the ball. Due to their focus on the centre of the pitch Bremen had to reduce the space in the middle. This created space for Hoffenheim´s wingers Kaderabek and Zuber who could make runs from depth and then cross the ball in after Hoffenheim shifted the play from the middle to the wing. With the ball Bremen constantly formed a 4-3-3. During the first phase the central defenders tried to start the play, while the fullbacks gave a wide passing option. Bagfrede usually positioned between Hoffenheim´s two strikers. The central midfielders of Bremen offered a passing option in the halfspace and their shape looked symmetrical with the aim to offer as much passing options as possible. However, Hoffenheim´s 5-3-2 defensive block made it hard for Bremen to play through the middle because Hoffenheim was able to stay compact in the centre as well as apply pressure once Bremen tried to get access to the ten-space. Furthermore, Bremen had problems to get the opportunity to play the ball into the ten-space. Their build-up offered a lot of passing options, however, the distances and the support in deeper areas was not always perfect. So, Bremen struggled to get the ball forward by playing through the middle. Here you can see. Bremen have a lot of players between midfield and defence of Hoffenheim. However, they couldn´t manage to get the ball forward on a constant basis. Here Bagfrede receives the ball and had no opportunity to turn and also can´t play a quick lay-off pass. Hoffenheim is able to press him with two players, Grillitsch pushes out of position with the perfect timing and Uth supported him immediately. The most interesting aspect in Bremen´s possession game was the position and role of former Gladbach and Wolfsburg player Max Kruse. Officially he started on the right wing but had a free role in the system. Quite often he moved into midfield and tried to get the ball in a deeper position. For example, Kruse positioned between Hoffenheim´s midfielders and took the place of Junuzovic who then played as an inverted right winger. Furthermore, Kruse could change the position with striker Belfodil. When Kruse played up-front he moved a lot, supported the wingers to create overloads or he moved into the midfield which created some numerical superiority situations. In those situations, Kruse showed his high football IQ. His movements were always supportive and balanced enough to help his team creating passing options. The problem with such a free role is often the lack of balance. For instance, some players move too much out of position and therefore ruin the structure in possession. Not only did Kruse managed to balance his movements Bremen also filled the open positions which Kruse left. That´s why in some situations you could observe that Eggestein or Belfodil covered the position on the right wing. But most of the time the Austrian captain Junuzovic was the one who played on the right wing instead of Kruse. As I explained above Bremen struggled to build-up through the middle. Consequently, they attacked from the wing which nevertheless seemed like the preferred way to attack. In some situations, Bremen could take advantage of their solid structure and overplay Hoffenheim´s defence with quick one-touch and lay-off passes combinations. In those situations, Bremen tried to overload one side. The central midfielder and either Kruse or Belfodil supported the ball-near side to give as much passing options as possible. The problem was that Hoffenheim managed to isolate Bremen on the wing and cut all passing options in the middle. Due to technical problems in tight spaces Bremen had a bunch of turnovers at the wing in the first half. In the second half Bremen managed to balance the attacks better and therefore had more space on the wing to successfully cross the ball into the box. The corner which led to the goal for Bremen based on a combination in the halfspace and then an overlapping run by left-back Augustinsson. After the equaliser the game got more chaotic and Bremen got dangerous through counter-attacks which they tried to use in the first half however, in the second half the distances between Hoffenheim´s players were bigger therefore a successful counter pressing was not possible. The first half was dominated by Hoffenheim´s well-structured possession game. However, Hoffenheim couldn´t manage to create a lot of chances. In the second half the more on counter-attack focused Bremen squad were the more dangerous team and scored the well-deserved equaliser. In the end the game was embossed by technical mistakes which destroyed the attacking plays of each team. And made the game in the end very chaotic.